Of all the photos of my wedding day, one has always carried a particular, unique kind of joy. It is an image not of me but of my bridesmaid, an Iraqi refugee, throwing her bare arms gleefully into the air, her black curls tumbling freely down her back. She had chosen the occasion of my wedding to remove the headscarf she had worn for decades – of her own choosing, to be clear, but with the belief that wearing it was a measure of her piety, her integrity, her virtue. Yet, here she was, scarfless, and still pious, still virtuous – only visibly so profoundly, richly happier than she had been before. A former "fixer" from Basra who had been kidnapped and shot alongside journalist Steven Vincent (who was killed in the attack), she had been in America just barely more than a year. I have thought of that photo frequently during the latest uprisings in Iran, as dozens of women risk arrest or perhaps worse by removing their hijabs in public. For my bridesmaid and me, that day marked a passage and a moment of unforgettable elation. I imagine a similar feeling has come to each of the women in Iran as well, for all the dangers they confront because of it. I have also thought of that photograph as I watch Western cultures, frequently tripped up by the manipulations arguments of pro-hijab Islamists and concerns about perceived notions of justice, increasingly embrace that same cloth. Oddly, but not insignificantly or surprisingly, from British schools that debate allowing girls as young as 9 to wear the hijab, to a new "Hijab Barbie," to clothing lines developed by Macy's, Nike and others, the West's concern seems to be far more about perceived "Islamophobia" than misogyny. Oddly, but not insignificantly or surprisingly, neither schools nor corporations have shown a similar desire to embrace the orthodox religious clothing choices of other groups. Where, for instance, is Orthodox Jewish "Sheitel (Wig) Barbie"? Oddly, but not insignificantly or surprisingly, this overwhelming concern about religious attire both overlooks and negates the hijab's sexualization of women and young girls, just as Western countries, hyped by the #metoo movement, are obsessing over the sexualization of women and young girls. 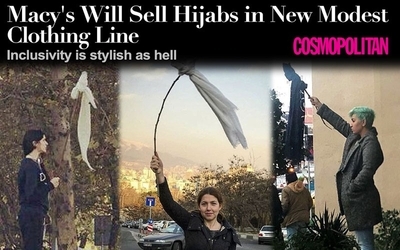 In fact, the new celebration of the hijab seems to be about celebrating all those things that we in the West generally condemn: pushing a new "must" trend for women in fashion and behavior; showing preference for one religious group over another; and above all, increasing the very real risks to those Muslim women who choose not to wear a head-covering by making models and icons of those who do. Which is why the implications of all of these pro-hijab gestures should worry feminists and all secular Americans – feminist or not. Barbie, after all, was never about reflecting what girls really look like, or making them feel "included:" Barbie is an unrealistic ideal, the ludicrously-proportioned eternal 20-year-old beauty whom girls are meant to aspire to be. Similarly, Macy's new clothing line supports, rather than discourages, a conservative view of Islam that represses women, in place of encouraging Muslim girls to assimilate and strive for greater freedom. Not to mention the patronizing assumption in a "modest" line of clothing that somehow Muslim women are incapable of putting together their own more modest outfits without the help of a Macy's label. And yet all of this occurs in a kind of tone-deafness, not only to the implications of a growing pro-hijabi, conservative Muslim culture, but to the protests of Muslim women around the world who are calling for it to stop. Moderate Muslims. Secular Muslims. Those women, and the brave protesters in Iran, merited no mention in the Council on American-Islamic Relations' (CAIR) news release Friday urging people to support Macy's new "Muslim-friendly modest attire that is coming under attack by Islamophobes." In the UK, meanwhile, even as the Foreign Office invited its staff to cover their heads to recognize World Hijab Day, a group of Muslim women has petitioned the education secretary to "demand that no young girls (especially not in state-funded schools) should be forced into conservative forms of dress." Or as the activist and journalist Asra Nomani put it in a 2016 New York Times op-ed on "World Hijab Day"– a day when non-hijabi-wearing women are encouraged to don the scarf , "Today, well-intentioned women are wearing headscarves in interfaith 'solidarity.' But to us, they stand on the wrong side of a lethal war of ideas that sexually objectifies women as vessels for honor and temptation, absolving men of personal responsibility. This purity culture covers, segregates, subordinates, silences, jails, and kills women and girls around the world." Others have noted the lack of any religious mandate for the veil, a garment that has traditional, but not Quranic origins. According to University of North Carolina professor Sahar Amer, the word "hijab," which means "barrier," is never used in the Quran "to describe, let alone prescribe, the necessity for Muslim women to wear a headscarf or any other pieces of clothing often seen covering women in Islamic countries today. Even after reading those passages dealing with the female dress code, one continues to wonder what exactly the hijab is: is it a simple scarf? A purdah [burqa]? A chador? Or something else? Which parts of the body exactly is it supposed to cover? Just the hair? The hair and neck? The arms? Hands? Feet? Face? Eyes?" Some, however, argue that the hijab makes them feel liberated, freed of the sexualization of women in contemporary culture. But it is a false sense. As Nomani and others note, the purpose of the hijab is specifically to "protect" women because they are nothing but sexual objects who need to be covered, hidden, protected from the lust of men who see them as nothing but the objects of their desire. "Veils for me represent both religious arrogance and subjugation: they both desexualize and fervidly sexualize," journalist Yasmin Alibhai Brown, a British-born Muslim, wrote in the Guardian. "Women are primarily seen as sexual creatures whose hair and bodies incite desire and disorder in the public space. The claim that veils protect women from lasciviousness and disrespect carries an element of self-deception." True, a hijabi woman does not wear her scarf in private, around her female friends. But I remember my bridesmaid in the year before she shed her scarf; even at home, she remained always slightly on alert. An electrician might come. A neighbor. A man. One had to be careful. One had to be prepared. It was a state of constant anxiety, as if facing an unpredictable but inevitable attack. No woman, no girl, should be encouraged – let alone forced – to live in this kind of fear. No girl, no woman, should be urged to hide the person that she is. And no woman should be celebrated for her subjugation. As ex-Muslim Yasmine Mohammed, author of the upcoming From Al Qaeda to Atheism, tweeted recently, "The absurdity of #feminists in the West embracing modesty culture while their disempowered sisters in the #Muslim world risk arrest, imprisonment, and worse to free themselves from the #hijab would be comical if it wasn't so tragic." That tragedy is real, and increasingly, Western corporate and academic cultures are complicit in its reality. I think of my joyful bridesmaid, her arms stretched skyward into the August afternoon, and wonder why we aren't building this reality instead.